We’re going to go out on a limb and say YES! No questions asked. Blog done, end of post…nah just kidding. Seriously though, my love of this company aside, they did put on the best (in my opinion) booth of the show, again affirming my belief that they are one of the best RPG publishers in the market today. I don’t just mean best as in best sales, award winning, and best product line, but also just a good company. For me they are right up there in quality, and customer relations as Steve Jackson Games and KenzerCo. 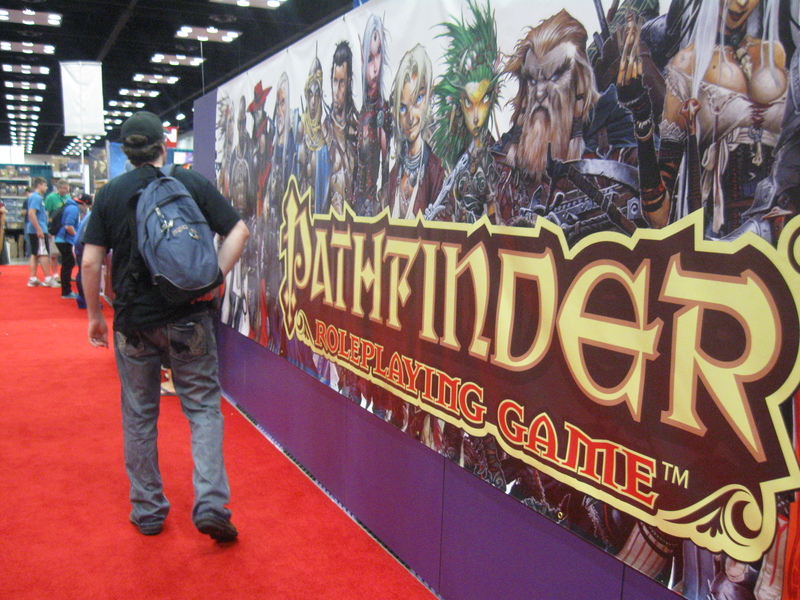 I did a comparison between their booth and Wizards of the Coast’s booth, and to me there is no real comparison. Sure, WoTC had the statue of Drizzt and the Spider Queen (pictures coming soon), but as far as showing off their product line they were more about hype than the product. Where Paizo’s booth was packed, wall to wall with product, and customers, WoTC was really a big empty space with a couple of statues, a few computer monitors featuring DDO and Neverwinter, and a small bookshelf with some product. While Paizo’s booth felt like it was all about the games and the fans, the WoTC booth seemed to be all about wow factor, and while the statues were very ‘wow’, riding TSR’s hard work just isn’t enough and you can’t forget about why you are there in the first place. Games and gamers. 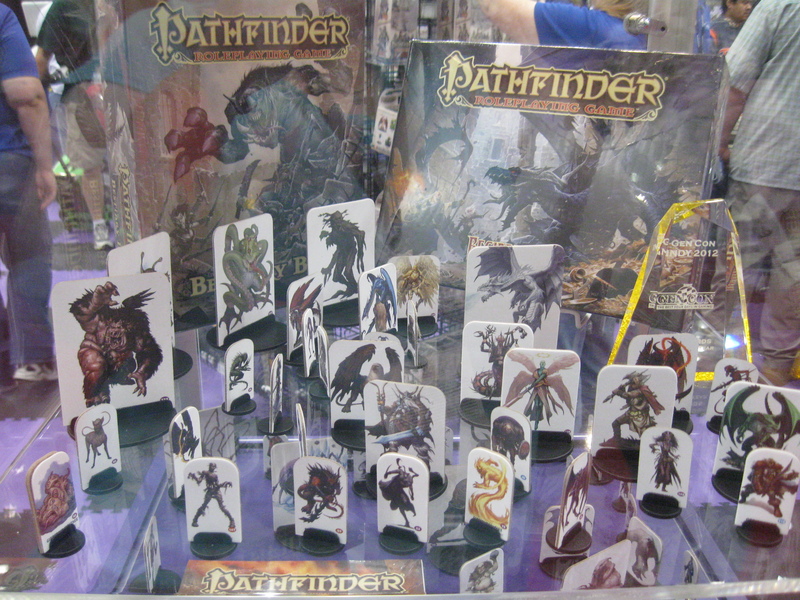 Did I mention that, as far as tabletop RPG’s go Paizo took the show? Not only in this writer’s humble opinion but The EN World RPG Awards agree. Paizo dominated the Ennie’s at Gen Con with a whopping 9 awards out of 22 categories. More than any single publisher in the running. Winning categories included Best Aid/Accessory (Silver), Best Art, Cover (Gold [duh]), Best Cartography (Gold), Best Free Product (Gold), Best Miniatures Product (Gold), Best Production Values (Gold), Best Website (Gold), Product of the Year (Gold), Fan’s Choice, Best Publisher (Gold). In the picture to the right, that’s also an Origin award if I’m not mistaken, they have several of those as well. The picture is the contents of the beginner’s boxed set along with a few other books scattered around. Short post for now, more pictures to share of course, and a couple more articles, then we are going to get into full swing with our GW2 coverage as I continue to familiarize myself with the game. Also stay tuned for news on an award we’ve been nominated for, next month’s gamer lady, and much more.